This is based on the article in Rights of Way Law Review written by John Trevelyan RWLR s.5.1 p.149. The effect of the Equality Act [EqA] 2010 is that it applies as much to equestrians as other users of the countryside. For disabled riders or those with other protected characteristics whose only or chosen way of access to rights of way and the countryside is on a horse or being driven in a carriage then the provisions of the Equality Act apply equally to them as to other users with protected characteristics. Whilst the act is limited to ‘protected characteristics’ and ‘prohibited conduct’ in relation to those characteristics there may be instances of wider discrimination as a result of restriction of a route or area where the public have rights (including equestrians) which would be better served by the Human Rights Act 1998. For those riders who qualify under the EqA 2010 these issues are many and relate to impairment to carry out normal day to day activities and would include the use of rights of way and equestrian access land. Where the ability to walk and take open air and exercise is substantial impaired then that should be sufficient to invoke the provisions of the Act. I for one suffer from a degenerative knee condition which severely restricts my ability to walk such that I choose to ride. My condition is also a major bar to remounting without steps or mounting block but the Act would apply equally to those who are unable to walk at all or who suffer severe arthritis. I do not believe that the guidance at Para D9 of the EQ A 2010 Guidance http://odi.dwp.gov.uk/docs/law/ea/ea-guide-2.pdf applies to riding horses for general recreation given that some 4.3 million people ride and 20% of all rights of way are available for lawful equestrian use. Riding has to be considered in terms of public recreation and especially Victorian public access legislation such as s.193 [Law of property Act 1925]as being “a normal form of recreation” (ex parte Billson) and not an exception as an activity involving highly specialised skills or levels of attainment. So that in terms of equestrian access for those who need to ride or drive the provisions should be applicable and relevant. 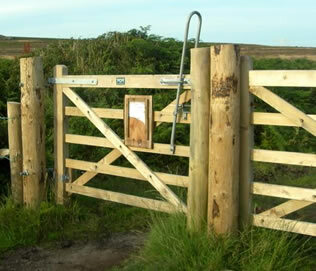 One of the key issues involving equestrian access to the countryside and the rights of way network is gates. These come in many forms, some licensed by the Highway Authority using S.147 Highways Act 1980, some are limitations on the definitive map and statement and some are a new phenomenon and consist of one way self closing gates for the introduction of conservation grazing programmes on commons, downland and upland moors. These gates are not only extremely hard to open and keep open long enough to get through but they are causing damage to the horses both physically and mentally. In these cases the gate itself becomes an obstruction and has substantial adverse effects on the legal activity on the land, and may be considered direct discrimination under the Human Rights Act or in the case of those with protected characteristics the Equality Act. a) Should the provider have reasonably known that the prevision of self closing gates would have a substantial adverse effect? b) Having been advised of the problem has anything been done to rectify it and is the discriminatory policy still being promoted. c) Where the provision of gates discriminates against more than one protected characteristic then that would be indirect discrimination. There is a duty to make adjustments (EqA S.20-22 & Sch 2) so there can be no excuse to continue with a policy which perpetrates the discrimination. There are further provisions to include the removal of the feature, altering it or providing a reasonable means of avoiding it (s.20 (9)). Even if conservation grazing could or should be considered a benefit in the exercising of a public function, and that depends on the dominant reason for which the land is held, is there still an unreasonable adverse experience. Here the balance of the enabling legislation is the key for a funding agency such as Natural England where it puts public access on the same level as nature conservation. The implication for riders with disabilities especially those such as arthritis of the hand for opening spring loaded latches and bolts or those unable to remount when gates cannot be opened from horseback are very much the same as for those whose only access is a mobility scooter. So promoted routes should make it clear if there are gates which are difficult or impossible to open from a horse or mobility scooter (S.29) or given the resource steam of such schemes as Higher Level Stewardship this should be a dominant criteria for the funding. The provision of a public function covers any function of a local authority, government department or agency or their agents. These include the local County highway authority, surveying and traffic planning and countryside departments, minerals and waste planning, National Parks, MoD, Natural England, the Planning Inspectorate and CCW as well as the District planning department. So taking a particular issue for disabled riders does the provision and promotion of one way self closing gates in relation to new conservation grazing which cannot be opened safely by disabled riders and requires them to dismount to pass through constitute a contravention of the Equalities Act or the Human Rights Act 1998. This question applies equally to the ability of the mobility impaired using cross country scooters who find they are often unable to even get to the handle let alone open the gate or that it is accessible only from one side of the gate. The provision of a kissing gate is likewise a problem as only the largest can be got through without an adjacent radar gate, yet we a re seeing a preponderance of medium kissing gates without radar gates being provided and installed to replace stiles. Is that to be considered proportionate? A recent case shows how it is not just gates that discriminate. The case involves a Highway Authority erecting barriers [s.66] on a public footpath which crosses a registered common which is managed under the Commons Act 1899 [rights to public recreation]. There is no highway verge as the road is laid out in an Inclosure Act and the common goes up to the metalled surface. The staggered barrier was erected to keep illegal motor bikes off the common rather than acting for the ‘purpose of safeguarding persons using the highway’ as required by s.66(3), no s38 consent was sort. This track is used regularly by a young girl whose only form of access to the countryside is either a mobility scooter or her pony. She is now forced to use an extremely dangerous road which carries aggregate lorries from a quarry instead of just crossing it. In some of the recent S38 (CA 2006) inquires no access or Equality Act impact assessment has been provided, nor has any consultation been carried out with a disability forum access officer but this has carried no weight with the Inspector. The need to have regard for the shared relevant protected characteristic has not been met. This is further complicated as there is no British Standard for self closing gates in terms of timing, ease of opening or width which caters for the cases quoted. Should the fact that large parts of the North Downs Way National Trail in Surrey are not accessible to the disabled, whether on mobility scooters or horses, be part of the review that NE does of its work. Should an alternative management regime to permanent fencing with self closing gates (S38 CA 2006) be implemented such as exempt grazing? Should all gates on rights of way be subject to review whether they are S147 or limitations? Should all LAFs give advice that has been EQ A 2010 proofed? That all Inspectors dealing with public access be it DMMOs, PPOs or S38 works and fencing have regarded to the EQ A 2010 by policy. Should all Highway Authorities including the Highways Agency and National Parks Authorities have a published policy on how they meet the requirements of the Eq A such that decisions on TROs and S147 gates are Eq A proofed. Why is bridle or other gates erected which are not designed or capable of being used by disabled riders or those in mobility scooters on their own and no enforcement policy is active.